Americans don’t save enough. Is this how we change their minds? Almost half of Americans live on the brink of financial disaster. That is, 47% of them couldn’t come up with $400 to cover an emergency, as detailed in a devastating cover story in The Atlantic. And it’s not just low earners: America is full of high earners who have almost no liquid wealth. To a large extent, low savings is a function of past success. The reason to save is the safety it offers, which is why during the so-called Great Moderation of the 1980s, 1990s, and early 2000s savings steadily fell amid shallow economic shocks and low unemployment. There was simply no incentive to put much money aside. The global financial crisis reminded savers, to their great cost, that the world is a risky place. It also exposed a policy shortcoming: other than retirement saving, governments generally try to get people to spend rather than save. But a thin financial cushion makes households more vulnerable, and by extension makes the entire economy more fragile, too. Can something be done? Yes, but it would require a radical shift in attitudes about the economy. The most obvious way to get people to save more is for the government to force them to. In Australia, 9.5% of wages are automatically diverted into retirement accounts. The US applies a lighter touch, with employers encouraged to deduct retirement savings from employees’ paychecks automatically (unless workers opt out). Although important, retirement accounts aren’t much good in an emergency if you can’t access them quickly without paying steep penalties. The simplest way to encourage people to build sufficient and accessible financial cushions is to reward them for doing so. With interest rates near zero there isn’t much incentive to save, unless you are willing to take on lots of risk in search for returns—which undermines the point of emergency savings. 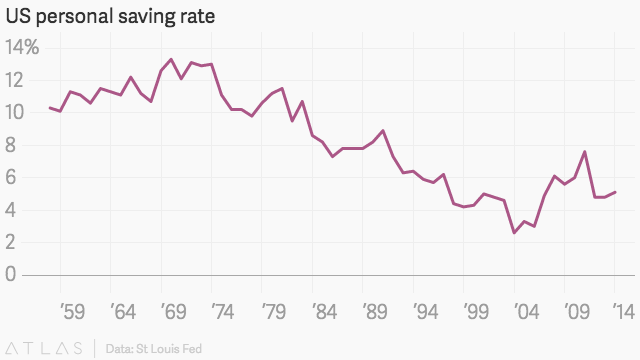 But the relationship between saving and higher interest rates isn’t so clear. Low rates can induce people to save more because they can’t rely on investment returns to build wealth. Economists generally conclude, however, that higher rates encourage more saving, but not by much (pdf). Central banks normally target inflation and unemployment when setting interest rates, not trends in savings. They are starting to consider broader risks to financial stability, but it will be a long time—if ever—before the savings rate figures into monetary policy decisions directly. Another intriguing idea is a saving lottery, promoted by Oxford economist Peter Tufano. Depositors in these special savings accounts are periodically entered into a lottery where the payout is based on the size of their account balances. On average, all savers earn a normal rate of return, but with an enticing shot at a large payout and no risk of losing principal. Prize-linked accounts have been around for a long time, but applying them at scale to address the under-saving problem is inspired by the observation that many low earners play the lottery. Prize-linked accounts have had some success in South Africa, but been slow to take off in the US. A more profound change in mindset is needed. Notice how the media celebrates upticks in consumption and declines in saving as signs of a healthy economy, when it could be interpreted as the opposite for the financial health of households. Government policies do little to reward non-retirement saving. And many in our society value a fancy wedding more than a solid retirement-savings account. Ambivalence toward saving reflects why people don’t save in the first place—we don’t appreciate risk, and can’t rely on others to push us to prepare for the future as diligently as we should.